You can transform any colour swatch into a linear or radial gradient. In the Colour view, select a colour to modify . Click the new colour and from the Colour View menu, select Colours > New. Double-click on the colour swatch. The Colour Picker window opens. Select the Linear or Radial option. To change one of the colours of your gradient, select a key colour from the gradient slider, then pick its colour in the colour picker. 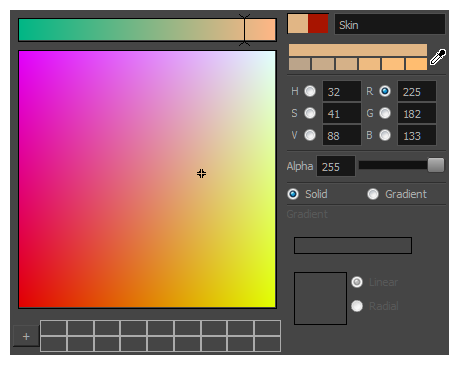 To add a key colours to your gradient, click anywhere on the colour slider, between the existing key colour. To delete a key colour, use the mouse to pull down on it. To move a key colour's position in the gradient, use the mouse to drag it left or right. NOTE To learn how to reposition the gradient zones in your drawings, see About the Edit Gradient and Texture Tool.